The use of ransomware has been on the rise in recent times. Earlier this year, a hospital in Hollywood paid $17,000 in Bitcoin to hackers who’d encrypted its files so they’d unlock them; a Canadian university paid $20,000 to attackers for the same reason just last month. And no, individuals aren’t safe from such attacks. In March, a new piece of ransomware began doing the rounds with the ability to encrypt your entire hard drive. Ransomware was also found bundled into a popular Mac app called Transmission around the same time. Whether you’re keen to ward off such an attack or have succumbed to one, there may be a way out that doesn’t involve paying scummy hackers. 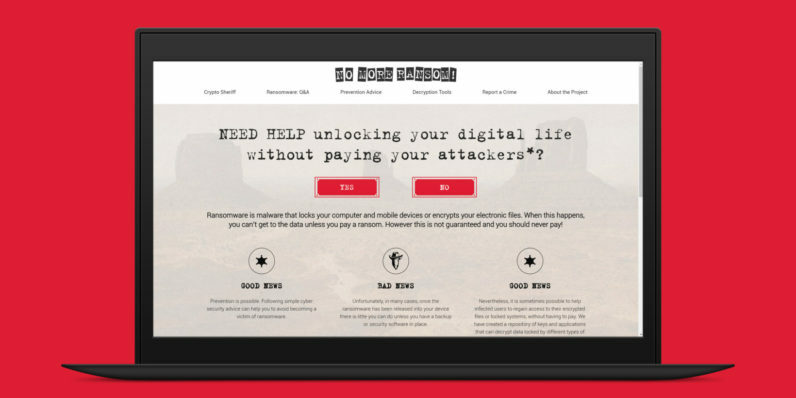 No More Ransom, a site built by the folks at Interpol, the Dutch police, Kaspersky and Intel, offers a range of detection and decryption tools, as well as tips on how to protect your data from ransomware. You can also upload your files to the site and check if any of the 160,000 decryption keys it has in its database can be used to unlock them. It may not always be possible to recover your files using these methods, but it’s certainly worth checking No More Ransom before you do; not only will you avoid spending your own hard-earned money, you’ll also be able to avoid funding hackers who don’t deserve a single penny.